This is one of the newest materials for use as a stamp mount. Some people in the business call it "neoprene." Many stamp companies now use it as an alternative to wood mount strips. 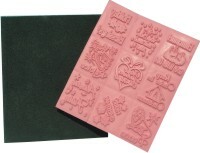 It is a 5/16" thick, rigid, lightweight backing for attaching your molded stamp die. Besides being less expensive than wood mounts, it saves money in other ways. It reduces labor costs since it does not need to be indexed and it reduces shipping expense since it weighs less. Cuts with a razor blade, scroll saw or one of our Stamp Die Cutters. With a perforating blade a group of stamps can be attached to one piece of dense cell mounting, cut, then the customer can break the individual stamps apart! The stark black color contrasts nicely with rubber dies. Includes a self-adhesive coating for easy attachment your rubber dies. Supplied in 12" x 12" sheets or custom cut to your specifications.